My work is to re-frame the narrative around historical artifacts and to put modern imagery into the context of history. Through my photography and my medium of photo composition and contemporary printmaking, I ask: "respice verum," look back at the truth. So much of American history can be found in sifting and digging through the story of Maryland. I forge across the Maryland landscape to find evidence of cultures long discarded and white-washed by history. Through the camera lens, I investigate nature, land, architecture, relics and material culture. With these images I seek to connect and integrate them within a composition that transcends time, space, history and popular beliefs. On the grounds of Hampton Plantation, we can be physically and mentally immersed in the true story of our country. If we can open our eyes, we can feel the truth wash over us when we pass through the mansion's opulent doors. We can sense deeply the emptiness of the slave-holding Ridgelys' ill-gotten ephemera. Captain John O'Donnell was a wealthy Irish man who came to Baltimore in 1785 to conduct International Trade from the port. He purchased 1,981 acres for his Canton Plantation, so called because when he arrived, his ship carried goods from Canton in China. The 1790 census lists his household as having 36 enslaved people. Today we know his plantation as the Canton area of Baltimore City. O'Donnell Street is named for Captain John O'Donnell, as is O'Donnell Square where a statue honors him. Nearby Elliot Street bears the maiden name of his wife. 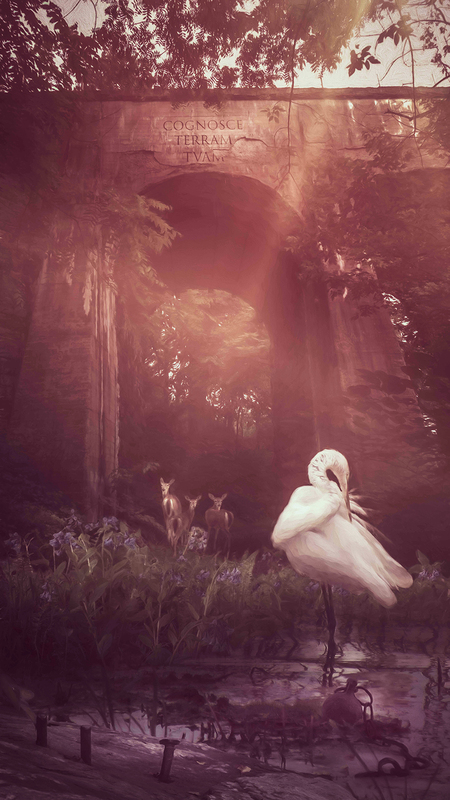 In the End, Archival Pigment Print (Photo Composition), 36 inches by 24 inches, Rose Anderson, 2018. The composition juxtaposes my photo of the marble statue on the west portico of Hampton Mansion (a childhood likeness of a member of the slave-holding Ridgely family) and crumbling row houses in Baltimore City. I have added the Latin inscription, which reads "Periturus sum", "I shall perish". Marble Urns in the Slaveholder's Garden, Archival Pigment Print (Photograph), 14 inches by 9 inches, Rose Anderson, 2018. Marble urns decorate the grounds around the Hampton mansion, the opulent home of the slave-holding Ridgely family where lavish gardens were maintained by enslaved people. Leaf Drowned in a Slaveholder's Garden Urn, Archival Pigment Print (Photograph), 14 inches by 9 inches, Rose Anderson, 2018. A fallen leaf submerged in the bottom of one of the marble urns on the grounds of Hampton Plantation. Broken Cupid, Archival Pigment Print (Photograph), 14 inches by 9 inches, Rose Anderson, 2018. Photograph of the marble statue on the west portico of Hampton Mansion, the childhood likeness of one of the slave-holding Ridgelys. I used this photograph with an added Latin inscription (Periturus Sum, "I shall perish") in my photo composition "In the End". The Ironmaster's Providence, Archival Pigment Print (Photo Composition), 24 inches by 36 inches, Rose Anderson, 2018. The work features my altered photo of the mansion at Hampton Plantation. The bench (circa 1850) is a functional ornament to the lavish gardens, purchased with the profits of forced labor. I have added the Latin inscription "Respice Verum", "Look back at the truth". The background is an interpreted view of a scrap yard in Canton, Baltimore City, formerly Canton Plantation. At What Price, Archival Pigment Print (Photograph), 14 inches by 9 inches, Rose Anderson, 2018. An ornate iron bench that the Ridgelys bought with the profits of forced labor circa 1850. On This Site, Archival Pigment Print (Photo Composition), 24 inches by 36 inches, Rose Anderson, 2018. The composition incorporates my photos of a decaying farm site on Maryland's Eastern shore. The iron corn-shucking implement in the foreground was provided for me to photograph by Nanny Jack & Co. and Philip J. Merrill. White Madonna, Archival Pigment Print (Photograph), 14 inches by 9 inches, Rose Anderson, 2018. My photograph of the statue on the East portico of Hampton Mansion, a likeness of two members of the slave-holding Ridgely family. The Owned Human Beings, Archival Pigment Print (Photograph), 9 inches by 14 inches, Rose Anderson, 2018. 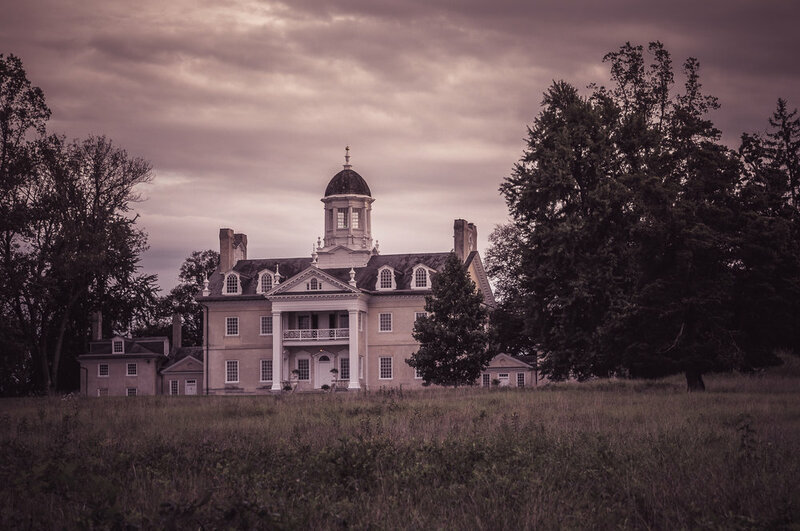 Photograph of the mansion at Hampton Plantation, Towson, Maryland.